NOBODY calls the Mississippi River “America’s Sorrow,” as the Hoang-Ho has been called that of China; but the Father of Waters has a habit of going on a spree with great regularity, and his numerous tributaries do likewise. It is probable that, given time enough, engineers will have built sufficient reservoirs and levees or embankments to keep the angry waters in check till they reach the Gulf of Mexico. But, in the meantime, floods continually keep showing up after unusual rains or thaws. Whole counties, in flat lands, will be inundated for miles back from the river. And these are good territory —not to be abandoned to the river. 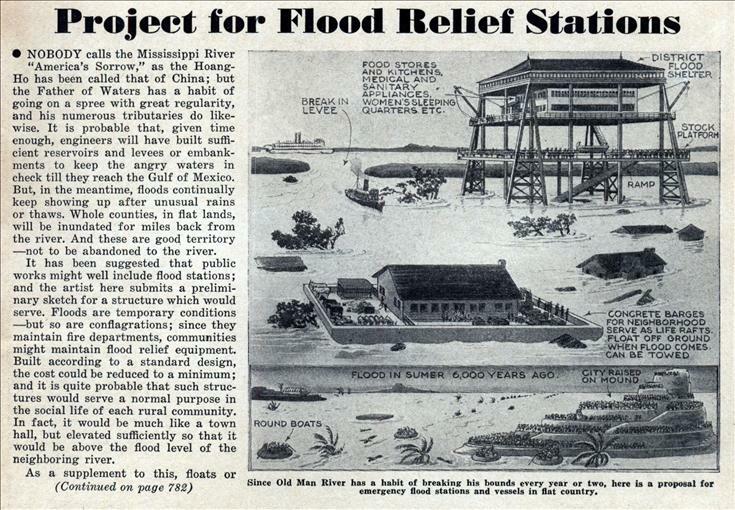 It has been suggested that public works might well include flood stations; and the artist here submits a preliminary sketch for a structure which would serve. Floods are temporary conditions —but so are conflagrations; since they maintain fire departments, communities might maintain flood relief equipment. Built according to a standard design, the cost could be reduced to a minimum; and it is quite probable that such structures would serve a normal purpose in the social life of each rural community. In fact, it would be much like a town hall, but elevated sufficiently so that it would be above the flood level of the neighboring river. 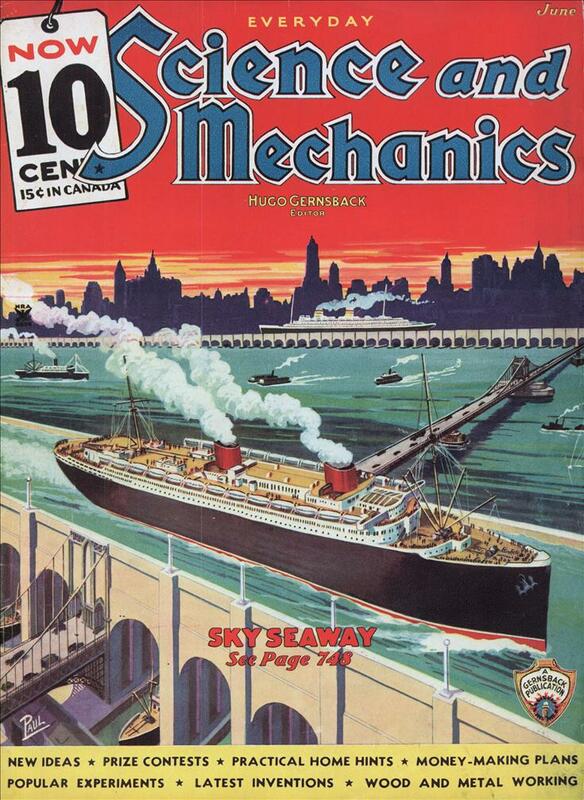 As a supplement to this, floats or barges for the use of a single family or group of neighboring families would be required. These can be built of concrete—a method of procedure which has been tested out. They would simply serve to float their occupants and movable property until taken -in tow by boats, and removed to the district shelter. Here food and shelter, with means of sanitation and medical relief, would be obtainable; with some comfort, if not luxury. It is interesting to note that floods are perhaps man’s oldest enemy, as regards his community organization. Six thousand years ago a terrific flood swept the first civilized region—the valley of the Euphrates in Asia — undoubtedly destroying practically all life, except where a few walled and banked cities had been raised, possibly on artificial hillocks, above the level of the “Plain of Shinar.” The inhabitants of Shinar or, as we now call it, Sumer, who survived preserved a tradition of a flood which had covered the whole earth, so far as they were able to determine; and praised the wisdom of those who had escaped by preparing stout boats well in advance. Perhaps the Americans will some day be as prudent as the “Chaldean Noah” in preparing for their inevitable floods. These are good ideas, mabye somebody should finally put them into practice. Hmmm… Maybe it’s a better idea to build everything on a stilts in a first place, as there are million(s) of people living in the Mississippi alluvial plain area, as far as i know. Well they could always just move out of the flood plain. It seems every time I see something about floods they show a friend of mine’s neighbors house washing away in the 1993 flood. @Hirudinea, many of these suggestions have been put into practice, only not on the Mississippi. How can you move out of the flood plain, unless there is someone willing to buy your house and move in? Once it is acknowledged that it is unrealistic to expect people to just walk away from their investments in residential property, then the remaining solution is to correct the problem. Putting storm sewers along the Mississippi and Atchafalaya river systems, for example, so that whenever they would flood, the excess water just goes harmlessly to the sea in… very big… storm sewers is not fundamentally beyond human capacity. After all, the Sun is radiating a lot of energy off the ecliptic. John Savard-Is it worth moving back if the cost of repair is equal to or greater than buying another house? After the 93 floods the Federal Government told people basically if they wanted to stay where they were they were on their own. Whole towns ended up moving away from the Mississippi. I don’t think you have ever been to the Mississippi River if you think they could build drain pipes all the way to the gulf of Mexico. Where I lived the river was normally a mile wide and about 21 feet deep. Flood stage there is about 31 feet and the river has topped 50 feet. That was at about the mid point of the river, just south of where the Missouri and Illinois rivers meet the Mississippi. It gets wider and deeper the farther south you go. So how big would these drain pipes have to be to carry the excess.